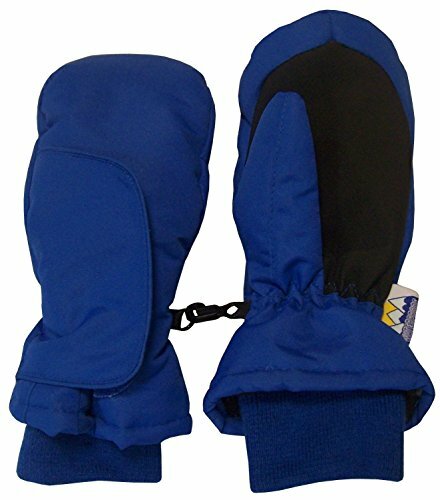 N'ice Caps Kids Easy On Waterproof Thinsulate hook and loop Wrap Mitten. N'ice Caps original construction. Colors available: Black, Fuchsia, Pink, Royal, Navy. Sizes available (with product dimensions): One size fits 1-2 Years (4.5" length from mitten elastic to end of mitten fingers, 3.0" width across palm of mitten); One size fits 3-4 Years (5.25" from mitten elastic to end of mitten fingers, 3.5" across mitten palm); One size fits 5-7 Years (6.0" from mitten elastic to end of mitten fingers, 3.85" across mitten palm); One size fits 8-12 Years (6.25" from mitten elastic to end of mitten fingers, 4.0" across palm of mitten). Tested and approved as per CPSIA standards.